FABRICAMEDIA is a project of Fabrica, Benetton�s communication research center. A series of DVD�s created in collaboration with the French music label NA�VE, dedicated to interdisciplinary projects which represent the ideal landing point for artistic vision based on a mix of media and languages and the overcoming of established genres. Fabrica has been elaborating a particular form of multimedia language where different elements of the artistic and cultural communication are developed together, organically. Images are no more simply illustration of the music and sound, as music and sound are no more just an accompaniment of images. It�s a new natural unit that presents itself as a fresh vocabulary; a vocabulary made of sensations, emotions, passions rather than words or concepts. CREDO is the second of the series of FABRICAMEDIA DVDs dedicated to Fabrica�s multimedia projects. 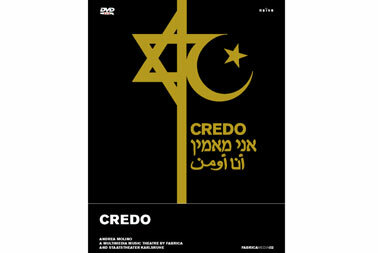 CREDO is a multimedia musical and theatrical performance about ethnic and religious co-existence and conflicts, produced by Fabrica Musica in collaboration with the Karlsruhe Staatstheater, with the support of the European Union and premiered in the very same Karlsruhe on April 30, 2004, with repeated performance on May 2. CREDO is a multimedia performance, with pieces of music, spoken parts, photographs and videos, performed by a symphonic orchestra composed of 90 musicians, David Moss and a group of over twenty young, international musicians chosen by Fabrica in countries including Israel, Turkey and Northern Ireland, where the project�s central theme is particularly relevant. The young musicians prepared for this performance with Andrea Molino, at Fabrica, have performed live from Jerusalem, Istanbul and Belfast, fusing their respective musical languages in a multimedia performance in which video elements and music sharing a common mode of expression, thus underlining not only the project�s advanced technology, but also its close relationship with the production�s theme, i.e. communication among different nations, cultures and religions. Credo has been presented for the first time in Italy last Novembre 11, 2004 in Rome for the 5th World Summit of Nobel Peace Laureates, promoted by the Gorbachev Foundation and the Comune di Roma, with the support of the Gruppo Cremonini and Grandi Stazioni. Behind me by Francesco Meneghini on Edit, Getty Images' magazine.